Since opening in 2009 Quest has focused on improving the health of the 'Kennebunks Community'. With over 60 classes each week including Pool, Yoga, Fitness and Group Cycle we are ready to take you on a journey of discovery to better health. Our clean and inviting fitness center in Kennebunk, Maine provides everything you need, right down to the full service locker rooms with saunas and freshly laundered towels. Visit us today to start your Health Quest. Are you looking for a fitness center that can positively impact your health and wellness? 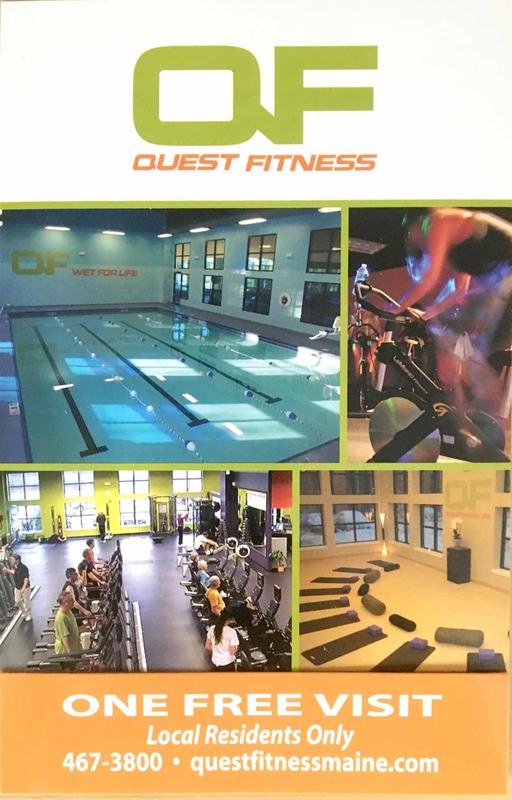 Whether you enjoy group classes or working out on your own with state-of-the-art equipment, Quest Fitness in Kennebunk, Maine is more than just a gym. Quest Fitness offers a variety of membership options to satisfy your needs and over 60 exercise classes every week. Just here for the short term? No Problem, we offer 10-visit passes, day passes or find the right short term membership for your budget and health. Call 207-467-3800 today to sign up for a membership at our fitness center in Kennebunk, ME. *FREE TRIAL PASS - One per person within a 12 month period, must be 18 years old or 14 years with an adult, local residents only. Please bring a valid picture ID when redeeming your free trial pass. Copyright © 2019 Quest Fitness, all rights reserved.